Osteoarthritis is a degenerative disease that most commonly affects the hands, knees, hips and spine. It is characterised by joint pain and stiffness. 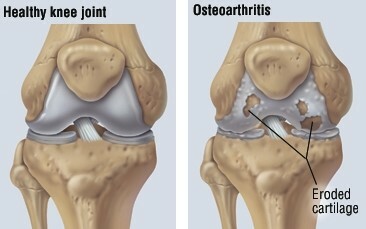 It is a common misconception that osteoarthritis is worsened by exercise, increasing joint damage and pain. However, if the mode and intensity is selected appropriately, exercise can have the same benefits for those with osteoarthritis as those without. These benefits include: improved aerobic fitness, increased muscular strength and endurance and improved flexibility. Additionally, it can improve function and reduce pain and swelling in the affected joints. Associated weight loss can also slow the disease progression by reducing pressure on the joints. So if you have osteoarthritis, look at exercise as an opportunity to improve your condition, not something that should be avoided as a result of it!